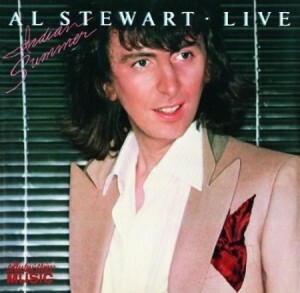 Live Indian Summer is a part live album and part studio album by singer-songwriter Al Stewart. Side 1 of the original vinyl double album with five songs were recorded in the studio and sides 2, 3 and 4 were recorded live at The Roxy Theatre in Los Angeles in April 1981. The live songs were released as a CD in 1997 called Live At The Roxy Los Angeles 1981 with the same cover. Side 3 of the vinyl album only had two songs, an 8 minute version of Roads To Moscow and 13 minutes of Nostradamus/World Goes To Riyadh which helps to explain why there were only 11 songs recorded live. This CD is out of print at the moment and, at the time of writing, prices are very high. Is this the best live album by Al Stewart? There are so many very good live albums by singer songwriters that I have spilt the poll into two divisions with promotion for albums that are very popular. I have included this in division 2. This entry was posted in 1980s Live Albums, Singer Songwriter Live Albums and tagged 1980s Songwriters, 1981 live albums, Al Stewart Live Albums, SS S by Paul Simister. Bookmark the permalink.